The global specialty tape market is anticipated in a report by Transparency Market Research (TMR) to find players employing advanced equipment and novel technologies to reduce emission during the production process. New types of adhesives could be researched for the purpose of introducing innovative products in the market. Players are expected to meet specific demands of consumers by launching new products in the industry. The market includes top players such as Saint-Gobain Performance Plastics, Nitto Denko Corporation, and Henkel Corporation. With a view to set footprints in different regions of the market and offer better products, players could shake hands with other participants of the competition. TMR prophesies the global specialty tape market to expand at a 5.7% CAGR between 2017 and 2026 to obtain a US$9.9 bn valuation by the final forecast year. Woven/non-woven specialty tape could outperform other products offered in the market while securing close to US$1.9 bn revenue by the end of the forecast tenure. Regionally, Asia Pacific excluding Japan (APEJ) is predicted to rank higher in terms of market share. 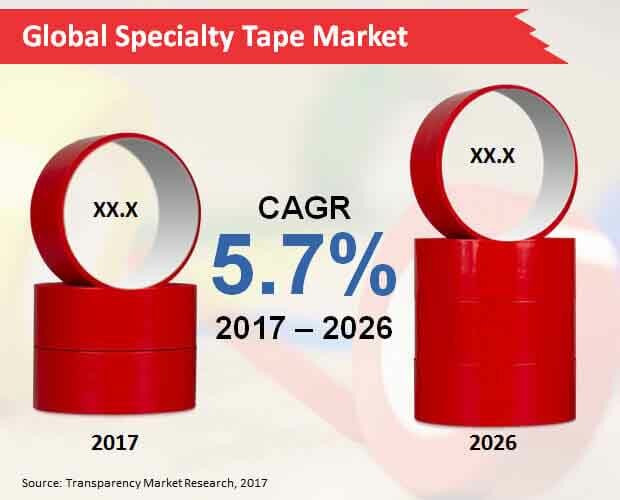 The global specialty tape market is prognosticated to gather pace as companies continue to offer new range of products with improved features such as dust, fire, and water resistance. Specialty tape offers more than adhesive tape, if the quality or uniqueness of features is concerned. Protecting from any damage, specialty tape is manufactured to hold objects that are heavy in weight. Manufacturers are exploring new areas of application, for which they could perform continuous research and development for coming up with new types of specialty tape. High resistance and ability to perform at both high and low temperatures are foreseen to push the growth of the global specialty tape market in the near future. Mixing and coating equipment is considered as one of the important elements that plays a crucial role in successfully manufacturing specialty tape. In this regard, there could be a large focus on its upgrade and modernization in the coming years. The global specialty tape market is projected to have a bright future. However, there could be certain factors weakening its growth. For instance, emission of VOCs could be a big challenge for manufacturers to face with. Various types of solutions are coated on a paper or film substrate during the manufacture of specialty tape. Nevertheless, with a number of regulations enforced by governments to reduce pollution, manufacturers are taking appropriate measures to ensure minimum emission during production. Weather and heat resistance properties of specialty tape are envisaged to increase its demand in the electronic equipment industry. Manufacturers are researching about the use of advanced adhesive technology to make specialty tape more applicable for electronic products.